In the past year and a bit I have been fortunate to be able to trial a few brands of bikepacking bags during my incessant need for backcountry bikepacking and bikerafting trips. I want to make it clear that some of this equipment has been supplied to me through sponsorship for projects but I have also purchased several items that I couldn't resist trying too. my latest incarnation rig for bikerafting. Big influence from the Salsa EXP range. Cactus Outdoor have been an awesome partner in the past 6 months and I felt very honoured to be asked to trial a pre production handlebar harness and seat bag and provide a small amount of input to the finished product. On the 5 day ride to film 'Looking Down is Looking Up- The Harper Pass Brevet' we were lucky enough to have support from Cactus and we put the gear through its paces in some rugged terrain. Just like most Cactus equipment the bags are built super tough and I reckon they'd outlast other brands. The Grippin alloy buckle is a great feature on both the Love Handle handlebar harness and the Love Bundle seat bag, hopefully when they are worn they will be easier to tighten but the reality is most straps are best tightened gently with pliers which can overload plastic buckles but not grippin buckles. The design team does have some finishing work to do on the density of the rubber handlebar bumpers. The seat bag is bomber and has the least sway of any seat bag I've used. Unfortunately it is not seam sealed but a plastic bag inside will keep your gear dry on most trips. The top tube bag is super simple light and has the added bonus of a mesh pocket on the outside that Muel tucked jelly dinosaur lollys into on the tour of central Canterbury. The Cactus Outdoor bikepacking gear is sewn up in the Christchurch factory keeping NZ working and this brings positive karma when purchasing. Also Cactus gear is renown for being 'Cactus Tough' and this has definitely trickled down to their bikepacking range. Finally, the price point of their range is lower than some other major brands made offshore making Cactus exceptional value. Trialling some of the first production gear from Cactus in the Canterbury backcountry. Salsa Cycles has an impressive range of bags recently updating their EXP range with frame bags for fat bikes and Salsa hardtails. The EXP Anything cradle is a design marvel and addresses the two major issues of the handlebar harness, cable crush and head tube rub. Check out my full review here. I recently took delivery of a EXP frame bag for the Salsa Mukluk which is incredibly cavernous and will definitely add a lot of value to that rig on bikerafting missions. Just like the entire range the frame bag is seam sealed and nearly waterproof. The EXP Seatpack, which has an air release valve for easy sealing is awesome,it doesn't need lining and will safely keep your sleeping bag dry in wet conditions. However when fully loaded the Salsa seat bag does have a fair amount of sway. The EXP Top Tube bag is significantly larger than the cactus model (for better or worse) is also seam sealed and has the option of bolt on to Salsa compatible frames. The water resistant nature of the EXP range makes them standout choices when using in damp environments especially bikerafting. 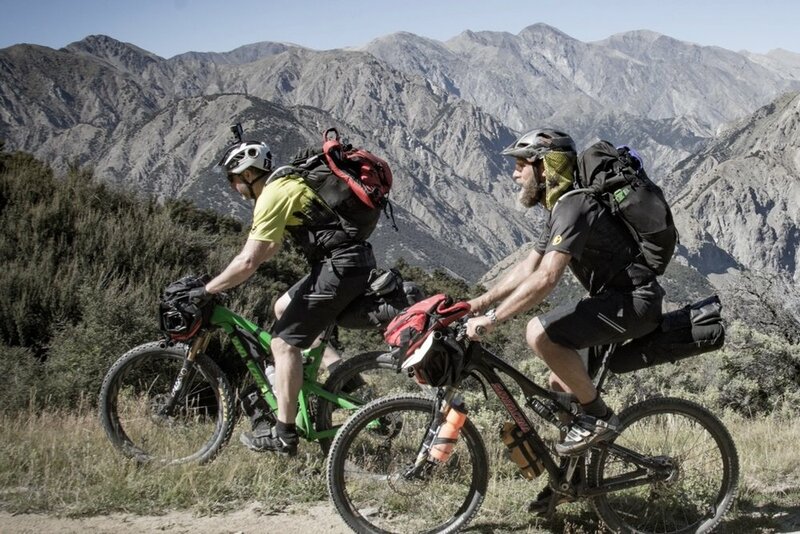 Salsa Cycles slogan 'Adventure By Bike' resounds through the entire range of bikes and equipment and is exceptionally well designed by the team in Minnesota and obviously the parent company, QBP has its offshore manufacturing channels dialled. The Salsa EXP Anything Cradle system with front pouch and dry bag, Southern Alps NZ. Salsa Cycles EXP range is available through Cyclewerks here in NZ and SCV Imports in Strayla. This image shows how the Salsa EXP Anything Cradle smartly keeps the load away from the head Tube and cables/hoses. climbing out of the Waiau-toa Clarence river after a solid week of adventure with Revelate gear. Revelate Designs is synonymous with bikepacking. Revelate helped start the surge of interest in loading a mountain bike with nylon bags and going backcountry. 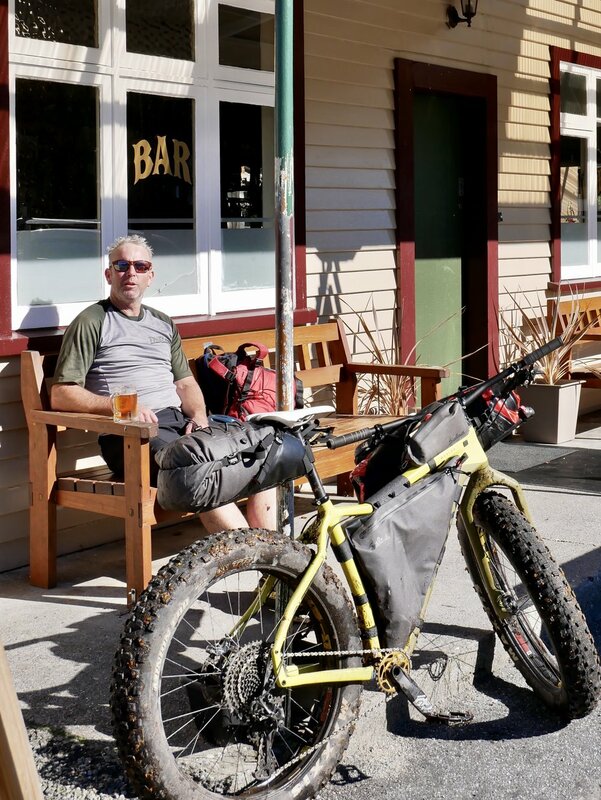 I used the Revelate handlebar harness and Pika seat bag for the 7 day journey that was Waiau-toa Odyssey and they performed very well. The handlebar harness never budged with packrafts/paddles and PFD's attached over hundreds of km of rough terrain and I believe the mark 2 model has made improvements further. The Pika seat bag was good, see my full review here. It did suffer a hole from scuffing against the seat post though also it is not seam sealed. Revelate Designs can be purchased in NZ from Cyclewerks. Shown above on Muel's bike is a seat bag from another good NZ manufacturer Stealth Bike Bags. its fair to say that the bikepacking gear market is flooded with brands and products . There is a bag to suit every rider in every application, this is a great position for the consumer as s/he has a wide variety of price/durability/weight/sizes to choose from not to mention the custom options. There really is no excuse to strapping some lightweight camping gear to a rig and going on a journey. It's your choice if it's a month long crossing of a continental divide or a sub 24 hour escape from civilisation into the hills, so get amongst it! This film was shot on a 2 day bikerafting loop I discovered on the West Coast. Bikerafting relys on using bikepacking bags at their limit including the extra loads of a packraft, paddle and bouyancy aid. Go anywhere do anything, bikerafting allows access and routes never before considered. Salsa Mukluk XO1 - Monster truck meets BMX! Think monster truck crossed with a BMX, The Salsa Mukluk will conquer any terrain you can throw at it! Salsa Cycles- EXP Anything Cradle System. This is got to be the ultimate handlebar harness for bikepacking. Fill the empty space on your full suspension bike with kit for extended trips. Tineli Performance Bikewear, Glove review. First impressions after 10 hours on the Salsa Pony Rustler. Revelate Designs- Pika seat bag. Ep 5- Zoe bikepacking 101. Taking Revelate Designs bikepacking bags for a test drive in the hills behind Oxford. A 3 day circumnavigation of Craigieburn Range.